Once again, pictures in old photo albums conjure up memories. It was the first real place that I could call my own. I was all of 24 and had spent the previous five years living in either dorms, shared apartments, or group houses. I was free of the loose entanglements created by cohabiting with strangers, all for the primary reason of saving money rather than any notion of camaraderie. It was 1985 and I had found this sanctuary in Arlington, Virginia. Rent was $385 a month, which in today’s dollars amounts to about $855. With student loans still to pay, it was more than I really could afford. But I desperately wanted a place to call my own, and I was exceedingly grateful for the first time in my life to live by myself. My post-collegiate roomies didn’t resemble the fun-loving cheeriness of the later “Friends” or “Big Bang” groupings on television. Although perfectly fine in their own way, each was typical of those with whom one arranges temporary living arrangements in a big city like Washington, DC. They were ambitious types who worked for the government by day and attended law or graduate school at night. We were all from mostly middle-class backgrounds, cordial with one another but never hung out or socialized together. The degree to which we communicated was usually in the form of notes left out as reminders that rent checks needed to be written, payment for the phone bill was due (cell phones had yet to be invented), and perhaps a plea for someone to please clean the bathroom. There were no memorable laugh track moments that I can recall. One of them a couple of years ago sent me a Facebook friend request in what I assume was a serendipitous, curious moment for him. It took me several beats to recall exactly who he was. We have never commented on each other’s postings. In spite of the financial challenge, I somehow managed to pull off being able to live in this one-bedroom apartment. It certainly wasn’t much to speak of. 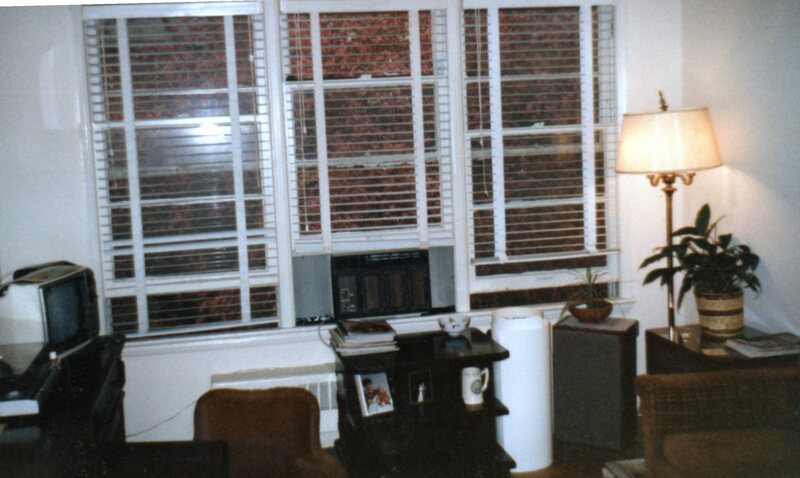 A second floor walk-up with no linen or coat closets, its non-insulted windows whistled during winter snow storms, and there was a depressing and mildewed laundry facility in the basement for resident use. 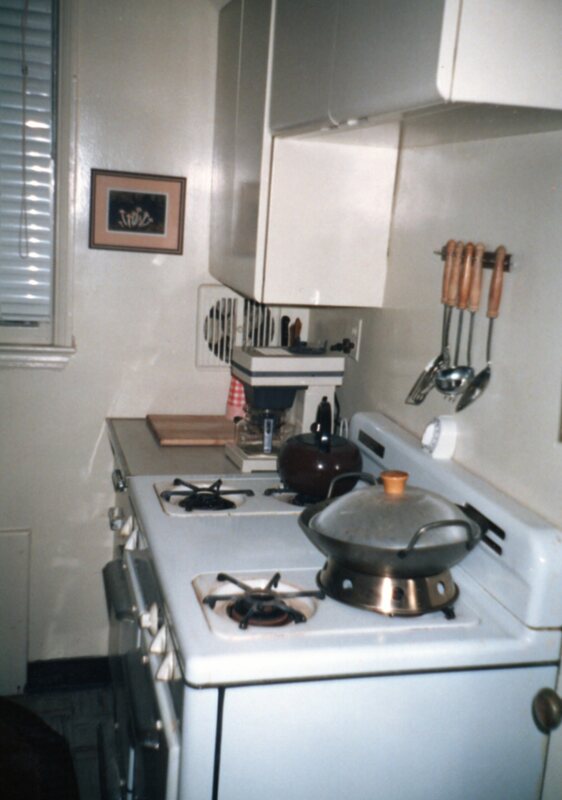 The tiny kitchen had no dish washer, but it did have a manual defrost refrigerator, and an early 1960’s gas stove with an oven that required a lit match at the pilot hole to start. The property had been advertised as “on a major bus line,” which was true enough. But that route was a destination to the Pentagon only, and from there I was able to get to the Metro and downtown to work each day. A Giant Food grocery store served the neighborhood of predominantly low-level civil servants like myself, working class families, and a large Hispanic community in the nearby Arlandria enclave. It wasn’t tony Georgetown or prosperous Woodley Park. It was a rank and file suburban neighborhood literally at the very edges of the county line. Except for the famed Birchmere folk club, which at that time sat in its original tiny and cramped location, there was really no reason to come to this part of Arlington unless your friends thought it’d be fun to have a picture taken in front of the unique spelling of the Waffle Shop’s awnings on Mount Vernon Avenue. Later on, that all changed. At that time, however, there just wasn’t much to see and do there. It was a place to live inexpensively and that was it. Ah, but I had determined that this was nevertheless where my private den of inequities was to flourish. I was a budding Casanova who had visions of unbridled moments with countless women who would visit the love nest. And indeed that all happened, except I experienced it through vicarious means of proximity rather than anything first-hand. I immediately recognized that several of my new neighbors were extraordinarily successful in that pre-Tinder, non-electronic hookup era. In time I got to know a few of them and had my own perch, as it were, to admire their skills. They actually met prospective lovers in person, with follow-up interactions that by my observations included genuine conversation and actual eye-contact. Looking back on it now, it was all rather quaint approach. The walls in that apartment building were quasi-sound proof. By this I mean that my neighbors probably didn’t hear the Today Show coming from my TV in the mornings because they were often in a comatose state after getting home around 2:00am each evening. In spite of the fact that I had already been asleep for a few hours, I was often generously offered drunken lullabies from these returning conquerors that stretched from the parking lot, up the hallway stairs, and all the way to their final bedroom destination. The sound of Prince’s “New Position” remains a special memory for me to this very day. Among the interior decorating options at my disposal, I ultimately went with something called Parental Rustic. What it lacked in originality was more than made up by the need for economic necessity. In a display of both generosity and opportunity, and ascertaining once and for all that their last child’s move from home was a permanent one, my parents happily shipped off to me the remnants of their 1970’s furniture. Reveling in my newly received booty, I added to it by hunting in second-hand stores and scanning the classified ad listings in the Sunday paper. Craigslist and eBay had yet to be invented. My interior design intents were succinct and simple: brown. And lots of it. I made my apartment a sea of brown with occasional genius touches of rust or faux-oak. Not only did it convey a sense of manly comportment, but it also had the added benefit of hiding beer stains. Looking at the pictures now, I am struck by just how much I miss about certain aspects of modern life from that period. Although digital recordings were just a few short years away, I love seeing my Technics turntable prominently displayed in that living room. My Advent speakers, the pride and joy of what I still proclaim is an admirable word, the hi-fi system, are far and away the best sonic experience I’ve ever had in a home environment. To this day I mourn the regrettable decision of selling them prior to my move to California. 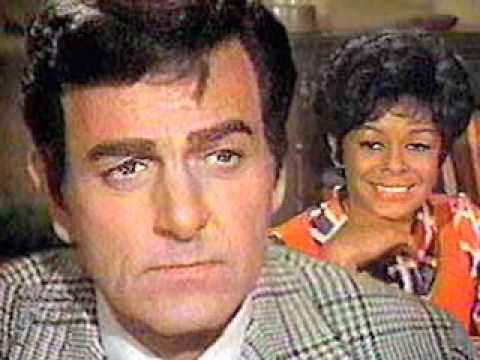 Even then my black and white Sears television was considered laughable, yet I recall many a night when New York friends who lived in DC would come to my home and happily watch Met, Yankee, Ranger, and Knick games, which for one reason or another were blocked from the District of Columbia cable offerings. Years later one of those friends shared with me the wonderful memory he had of watching all of those games on my tiny 12 inch screen. And, of course, there was that bulky, brown, corded phone. It was just waiting for Joe Mannix to pick it up and check on a source to give him vital information about a blackmail threat. I lived in that apartment for three years before moving to a nicer place just up the road in Pentagon City. It later went through three name changes and renovations to the apartments and outside facades. Reading Yelp reviews of it now, it seems that it enjoyed having a semi-chic standing for a short period in the early 2000’s, to again settling back to the fading property that I might recognize from my own time there — but one that is now roach-infested and suffering from a neglectful management. The young man who lived there himself eventually began to develop skills at both conversation and eye contact. He likewise acquired an ability to glimpse out at a world through hues that provided far more than the those earlier, singular tones in which he felt more comfortable. He later developed an appreciation for shades, and all the subtleties that they offer. It is those shades, after all, in which one sees so many of life’s interesting facets. Your apartment looked so very neat and tidy. And boring. Not that my first place was any better, but at least it had a more “free spirit” look to it – the classic look of Early American Hippie: beanbag chairs, cinderblock and pine plank shelving for the ever popular spider plants, and homemade low tables to sit cross-legged at and sift the seeds from your weed. You were but a child during the early 70’s though, but when you did get your own place, it sounds like it was your little heaven, regardless of the condition of the place. Ah, good times…. Those were the days, my friend.My first was a walk-up One bedroom alcove in a brownstone on a tree lined street between Park and Madison on the Upper East Side of Manhattan. A 7 block walk to the Lexington Avenue subway stop at Lex and 86th Street. Just 5 Express stops to Broadway and Wall Street in the financial district in lower Manhattan. Notice I said alcove rather than L shaped studio,. A gas oven and a half sized refrigerator that was decidedly not frost free. But it was the Upper East Side and the neighborhood was called Carnegie Hill. Bliss for a young man looking to become a Master of the Universe. That never happened of course. Instead of becoming some one who people turned to admire as I walked past them, I remained one of those who turned and looked as real celebrities cruised by on the sidewalks. Wow…. “Master of the Universe.” The old Bonfires of the Vanities line from Tom Wolfe. You pulled that one out of the attic! At least you were on the Upper East Side, which was (and is) a world away from the far reaches of Arlington County. Still, the alcove does sound very tiny. Do you recall what you paid for that tiny apartment???? Tom Wolfe was often seen in the area, Woody Allen lived around the corner. The alcove was tiny – a bed, a bureau, and a chest of drawers. No space for a chair, and the apartment’s only closet. The bedroom had a double french door to seal it off from the living room – but had zero walking around space…just enough to stand in front of the window and pull the shade up and down on one end, and on the other end – enough space to open the bureau drawers while standing in front of them. Perhaps you are related to my husband? When we moved into the same house, I happily donated all his BROWN furniture to Goodwill! Everything was brown except for the terminal beige carpet. Now we thrive in living color! I remember my first solo apartment! I felt so grown up. I am amazed that you have pictures of your place. 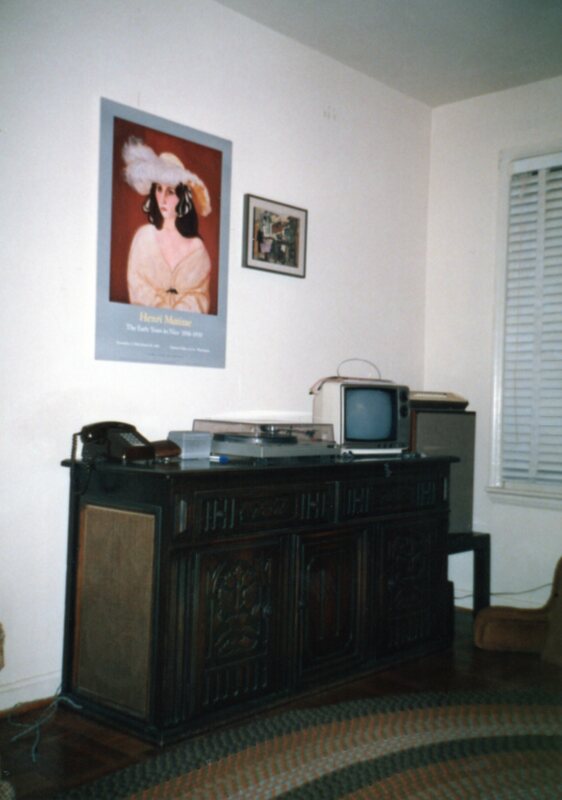 I think I may still have one or two pics of friends in my living room, but I didn’t think to take any of just the space (obviously pre-digital and pre-Facebook). Washington DC must have been a wonderful place to live as a young single person – lots of energy and action (if not exactly the kind you were hoping for). DC was a great place to live as a young person. It did change post-9/11, though. But I recall being able to walk right into government buildings, Smithsonians, etc. and not have too much in the way of security; driving on Pennsylvania Avenue in front of the White House to show visiting friends from out of town, etc.. All of that is changed now. 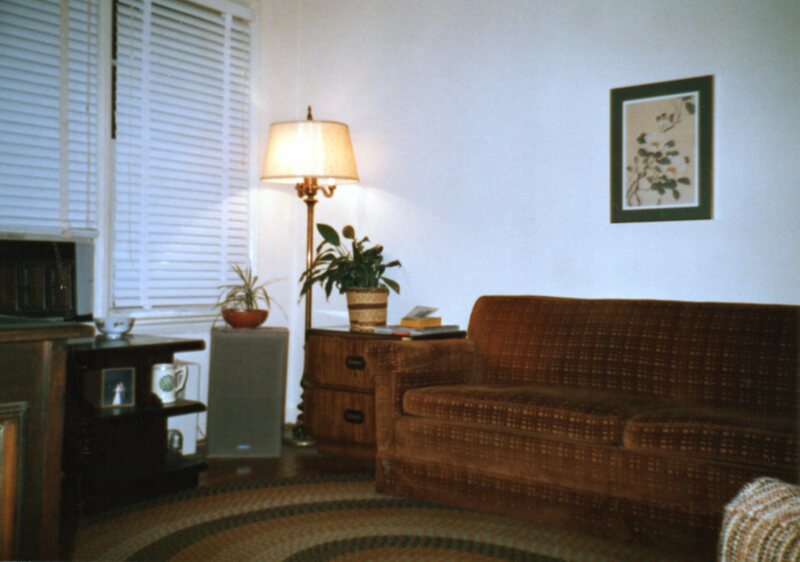 Brown must have been the required color of cast-off furniture. I had my share! Marty, you write about $385 rents. Just to let you know what you are missing, this morning’s lead story in the Oregonian is about exploding rents in Portland and leads with a fellow paying $995 a month for a 250 sq. ft. “micro unit” in NW Portland. And he has to use a kitchen facility that is shared among tenants. ( http://www.oregonlive.com/watchdog/index.ssf/2015/09/post_19.html ) If you remember the parking lot by the MAX stop we met at across from your hotel on your pre-move visit, that parking lot is now home to 3 large buildings with a total of over 650 new apartments. I toured them and rents range from around $1,500 – $2,800 a month. Yeah, rents were cheap in our younger days, but, apparently, they were even cheap when you left town. At least, compared to now. Yep, it’s always relative, Tip. I really think what I was getting at with the $385 is that it was a lot to me even then. I was lucky to find a reasonable place in a fairly safe area of town that was just on the cusp of some pretty questionable neighborhoods. Very interesting about Portland’s current rent costs. We were paying $1900 for our loft there, and we were might glad to at leave that monthly rate. Thanks, Tip!